Schiller Park, IL - Stanat Precision Machine Company has completed the installation and start-up of a new high-speed ultra-precision light gauge coil slitting line at a major midwestern aluminum slitting and coil coating facility. The new slitting line is slated to process mill finish, painted, and embossed 1100 through 5052 aluminum alloy coils in tempers ranging from 0 through H38, in gauges from 0.006" through 0.062" at line speeds to 1,000 FPM. The new Stanat Precision Slitting Line features tight line, single loop, and double loop slitting modes, multiple quick-change ultra-precision slitter heads, non-marking strip tensioning, and a unique "Loop-Doubler" that minimizes looping pit depth requirements. The "single-loop" and "double-loop" operating modes allow the efficient processing of both mill finish and critical surface coils. The single-loop mode employs the slitter to "pull" the coil off the uncoiler, and is generally utilized for slitting non-critical surface mill finish coils. The "double-loop" mode, utilized for slitting critical surface coil, incorporates a variable speed DC motor driven uncoiler to drive the strip into a free loop between the uncoiler and the slitter, resulting in slitting under zero tension conditions. Zero tension slitting produces closer tolerance slit widths and eliminates slitter knife scuff marks. A high performance drive system allows the Uncoiler to form a free loop above the floor at full line speed. In addition to the single loop and double loop operating modes, a "tight-line" mode is included for surface inspection and high-speed side trimming. The quick-change slitter heads incorporate ultra-precision machine tool roller bearings secured in solid one-piece precision-machined steel block bearing frames to support the slitter arbors. The outboard arbor bearing frame is mounted on precision anti-friction linear guides that allows the outboard to be positioned for running or tooling set-up. Shimless tooling and zero backlash arbor jack screws with electronic position readouts are utilized to accomplish precise horizontal and vertical knife clearances. The slitter head is a quick-change design that allows tooling set-ups to be made off-line while the line is in operation. A DC slitter motor drives the slit strips into a free loop ahead of the strip tensioning equipment. A unique "Loop Doubler" allows the line to produce large diameter light gauge slit coils utilizing only a shallow looping pit. The Loop Doubler eliminates the need for a deep looping pit with its ability to form two free loops between the slitter and the tensioning equipment, essentially doubling the effective pit depth. In addition, the Loop Doubler transports the slit strips across the looping pit, thereby eliminating the need for a carryover table. 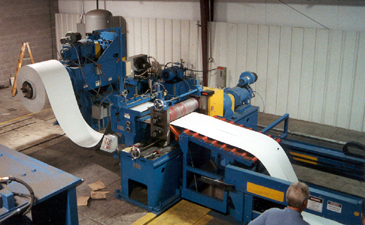 The Stanat Precision Slitting Line utilizes dual tension units to produce tight straight sidewall coils. 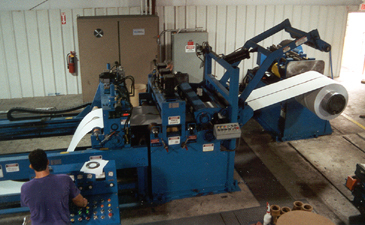 A pneumatic pad tension unit is employed to generate winding tension for non-critical surface coils, while a non-marking roll tension unit is utilized for processing painted and other critical surface coil. The pad tensioner utilizes inexpensive disposable felt strips attached to quick-change pads to generate winding tension. Pneumatic cylinders position the pads, while a remote pressure regulator allows the operator to adjust winding tension. The non-marking roll tension unit utilizes special tension rolls to generate high winding tension without scuffing or otherwise marking the strip surface. The non-marking "sure-grip" tension rolls incorporate a high friction non-segmented roll surface ideal for tensioning soft light gauge surface critical strip. The new "sure-grip" tension roll design is an enormous improvement over older "sliced" or "diced" tension roll design as sliced and diced rolls collect contaminants in the roll grooves and transfer those contaminants onto the strip. Stanat Precision Machine Company specializes in the manufacture of ultra-precision light gauge slitting lines, high speed traverse winding/edge conditioning lines, and strip rolling mills.